If you're a Radio Times reader you will know that interior designer and bling lover, Laurence Llewelyn-Owen has described Swedish home furnishing retailer Ikea as ' the Blond leading the Bland towards an impossible dull Beige-topia'. So, he won't be visiting Ikea anytime soon, I guess! Not like the rest of the human race, who if we are not going there to buy a Billy bookcase, then are almost certainly entering the blue and yellow superstore to eat! Almost a third of Ikea's customers visit its stores to eat - but are the meatballs that good? Looking at the gridlock that surrounds my local Birmingham store at the weekend, they must be. The fight to get the last parking space, so you can 'inch your way' (or should I say 'centimetre your way') around the cavern of flat-packed Swedish dreams, only to end up with a potted plant and a scented candle makes you wonder if it is worth the drive there. 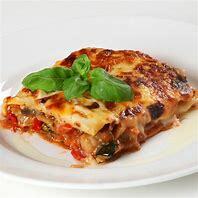 But it has to be a family occasion, so make the most of it by taking in the funfair atmosphere at the entrance before proceeding to wrestle for a table in the restaurant, hopefully with a window view, so you can look over the car park at the the six lane motorway. 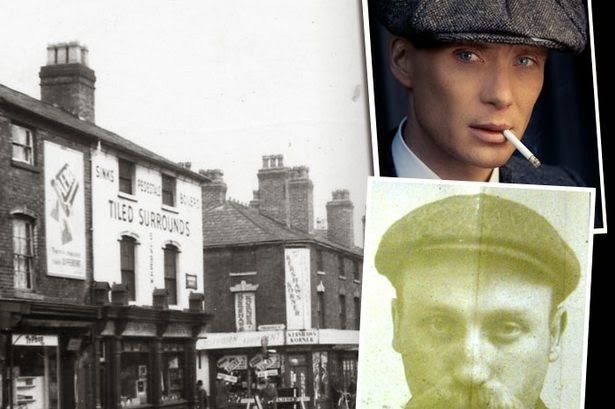 And after that cut-price full English breakfast at only £1,50 with a family card or a plate of kottbullar or 'meatballs' as we call them, go straight back home again without so much as a glance at a Po chair or a Bog picture frame. 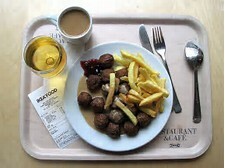 If you are a regular visitor to Ikea, then you will already know that food is a big thing with the Swedish giant. 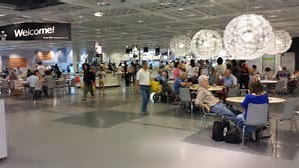 I visited the original Ikea store in Stockholm last year and it is the same there. Two years ago, I was in Ikea in Perugia, in Italy and its the same there. The company has shifted nearly 12 billion meatballs in the UK since 1987 and its worldwide food sales are more than £1 billion pounds a year. 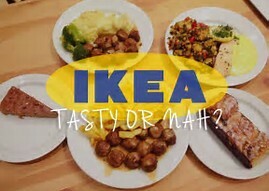 Apparently 30 per cent of Ikea customers visit their stores with no intention of buying furniture, but just to eat! But it does not stop there - Ikea now plan to open a chain of stand-alone restaurants, bringing their mighty meatball and cinnamon buns to the masses. The press are quoting Ikea's head of food as saying that they hope that in a few years time, their customers will be saying, ''Ikea is a great place to eat, and by the way, they also sell some furniture.'' I must admit, I love combining shopping with eating and I'm not alone. Look at the expansion of restaurants at garden centres as just one example. 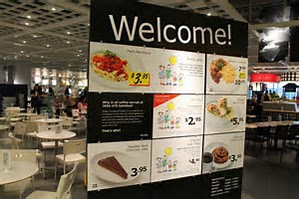 But back to Ikea's modern, airy restaurant - queuing with a tray or a host of trays mounted on something resembling a supermarket trolley and a tricycle only reminds me of the similarity to a motorway service station. However, there this similarity ends - the quality of the food and the great prices make all the queuing with the packs of Brummies worthwhile. If the furniture in the store is almost at giveaway prices then the food is given away - smoked salmon salad at £2.75. and ten meatballs with fries and the tasty ligonberry sauce at £3.80. You can't even buy a halogen light bulb for that! And as for the quality - it does the job, much as school food will help you through that dreaded PE class and hospital food helps get you through that knee operation, Admittedly, it's nicely served, unlike the work's canteen, and you sense that the cooks' take pride in their dishes, but at the end of the day it's food as fuel to help you carry on buying saucepans or coat hangers you don't really need. With that said, I'm a frequent client of the Ikea eatery and if you've never tried it, then you must be in a small minority of the population that like Lawrence Llewelyn-Bowen prefers bling to bland!